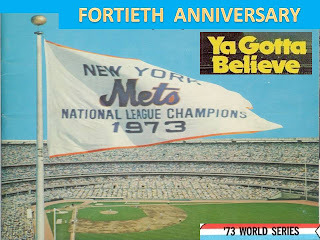 The Mets ended the 1972 season at 83-73, thirteen games behind the Pittsburgh Pirates in third place. They also finished two and a half games behind the second place Chicago Cubs. 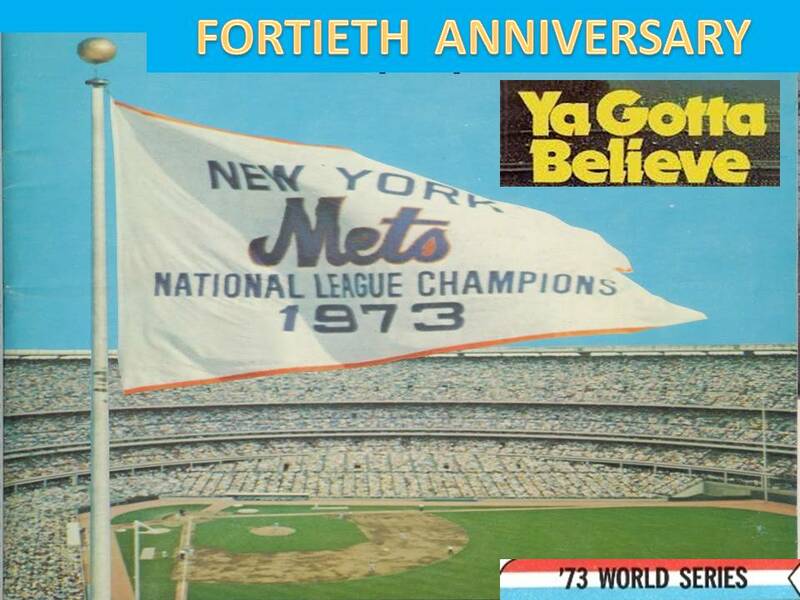 The year was a tough one, as they never really bounced back from the shock of Gil Hodges death. During Spring Training just before the start of the '72 season (which was also delayed by a players strike) Hodges suffered a fatal heart attack. The players loved & respected their manager who led them from being a losing bunch of kids to the 1969 World Series Champions. 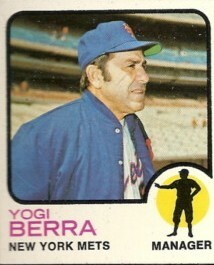 Hodges successor was the popular choice; former coach Yogi Berra. But Berra may not have been the best choice, Whitey Herzog had done a spectacular job as head of player development in the minor leagues. Many of his players contributed to the Miracle of '69 & were now on the club. Two years prior, Herzog was against the trading of Amos Otis to the Kansas City Royals for third baseman Joe Foy. Prior to the 1972 season, he was against was trading away of Ken Singelton, Tim Foli & Mike Jorgensen to Montreal in exchange for Rusty Staub. That decision is disputable, as Staub would be the team's biggest RBI man over the next years & the most key hitter in the Mets 1973 post season. Singleton, Foli & Jorgensen went on to have fine careers throughout the rest of the seventies. Herzog would leave the Mets organization & go on to a Hall of Fame managerial career. 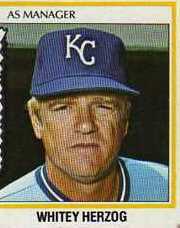 In 1973 he started his years as manager of the Kansas City Royals, where he would win three straight divisional titles, (1976-1979) with Amos Otis as his centerfielder. 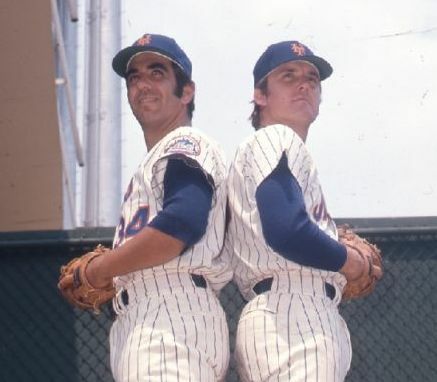 The Mets ended the 1972 season with a lot of faith in their pitching staff for the future. 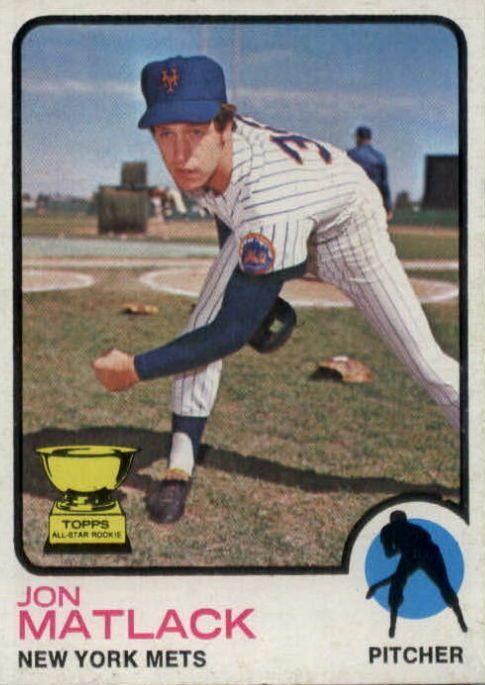 Rookie of the Year Jon Matlack (15-10 / 169 strike outs / 2.32 ERA) solidified himself in a rotation that already included Tom Seaver (25-12 / 249 strike outs / 2.92 ERA) & Jerry Koosman who had an off year; (11-12 / 147 strike outs /4.14 ERA). In 1972 Jim McAndrew also had his best season (11-8 / 81 strike outs / 2.80 ERA) but Gary Gentry, the young star of the '69 staff, had fallen to 7-11 with the second highest ERA of any starter on the club at 4.01. In the bullpen Tug McGraw had become one of the best relief pitchers (fireman as they were called back then) in the league; (8-6 / 27 saves 1.70 ERA). The rest of the bullpen included veteran Ray Sadecki, young Buzz Capra & Harry Parker who was acquired in the previous off season, & had pitched well at AAA Tidewater. The Mets other top reliever in the bullpen was Danny Frisella (5-8 / 9 saves / 3.34 ERA) a slight drop from his 1971 season where he posted a 1.99 ERA with 12 saves. He was an attractive trade possibility & a key chip in a November move. The Mets wanted to get more production at second base, Ken Boswell had improved his defense through the years but only hit .211 & was limited to 100 games. Boswell also had a shoulder injury which concerned the Mets going in 1973 & backup Teddy Martinez was not considered a regular player at the position. In November 1972, the Mets made a deal with the Atlanta Braves, trading pitchers Danny Frisella & Gary Gentry in exchange for pitcher George Stone & second baseman Felix Millan. Millan was a two time Gold Glover & three time All Star who had batted .289 or better three times in the past five years. The Braves had just made a blockbuster trade with the Baltimore Orioles & acquired Davey Johnson for the second base job. Johnson would be one of three Braves to hit over 40 HRs that season (Hank Aaron & Darrell Evan being the others). Stone was a six year veteran left hander, who had come off a 6-11 season with a 5.11 ERA. In 1969 he had had his best year going 13-10. This would be the most significant move for the Mets that off season. Millan would become an excellent double play partner for Bud Harrelson, posting the third best fielding % of all N.L. second baseman (.989%) making just nine errors in 830 chances. The Mets defense up the middle was outstanding, Millan would play in 153 games, the most of any player on the club. At the plate he led the team in hits (185) batting (.290) runs scored (82) & tied with Wayne Garrett in on base % (.348). Millan was the toughest player in the league to strike out in each of the next three seasons, averaging thirty at bats per strike out in that time. He was a pure line drive singles hitter, famous for choking up way high on the bat. As for Stone, he too would have his best season in New York that year going 1-3 with a save, posting an .800 winning % & a 2.80 ERA in 20 starts. More importantly from mid July to the end of the season he was a perfect 8-0 helping in the Mets chase for the NL Eastern title. Another major deal the Mets made that winter was parting ways with the popular Tommie Agee, one of the stars of the 1969 World Series. Agee had gained weight & was not taking care of himself as well as he could have. During the 1972 season, young slugger John Milner came on to the scene & was playing mostly in left field. Milner was looked at as being the Mets HR hitter of the future & the organization had high expectations for him. Cleon Jones, Rusty Staub, veteran Willie Mays & a youngster who also was showing a lot of promise; Dave Schneck were all considered part a solid outfield corps. Agee had only hit .227 with 14 HRs in 114 games & was thirty years old, he was the odd man out. He was traded to the Houston Astros for outfielder Rich Chiles & pitcher Buddy Harris. Neither factored much into the 1973 season. & Agee himself would retire at the end of the year. Other minor deals made by the Mets in the off season; were the trading of pitchers Brent Strom & Bob Rauch to Cleveland for reliever Phil Hennigan. Hennigan would go 0-4 in thirty games , while getting sent down to AAA Tidewater in July. New York also traded Dave Marshall who had played mostly at third base in 1972 (.250 / 4 HRs 11 RBIs in 72 games), in exchange for Al Severinsen who never played for the Mets at all. That decision meant Jim Fregosi was still the Mets main third baseman, although he would continue to struggle & be also gone by the summer. Fregosi had been traded for Nolan Ryan prior to the '72 season,& was now one of the best pitchers in the American League. That deal haunted the Mets for many years & would factor into future trades that the team was scared to pull the trigger on, involving their young pitchers. Most notable a 1973 off season trade rumor with Houston to acquire the Toy Cannon; Jimmy Wynn. Wynn would go on to hit 33 HRs, drive in 108 runs, make the All Star team & get to the 1974 World Series with the L.A. Dodgers. 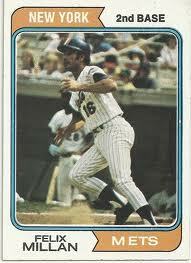 Wayne Garrett would become the teams main third baseman & go on to have his finest season in 1973. Also that past November; the Mets lost pitcher Mike Bruhert who was drafted away by the Phillies but was returned to them in April. The Mets drafted also Nardi Conteras from the Cincinnati Reds. In February, they traded away a once promising minor league pitcher; Barry Raziano in exchange for pitcher Jerry Cram who would pitch a few games in New York through 1975. At the end of Spring Training they traded away a once promising slugger from Los Angeles, named Bill Sudakis, but injuries had ruined his career. The Mets received Bill McNulty from Texas, who hit .248 at Tidewater & was gone by 1974. That June the Mets would draft Lee Mazzilli as their number one pick, as well as Jackson Todd, Mardie Cornejo & Warren Brusstar in later rounds.